Renewable Sonoma was founded on the belief that we need to process our organics in-county. Our farmers, landscapers and backyard gardeners deserve high quality composts and mulches that meet the needs of the community at an affordable price. Renewable Sonoma goes beyond what Sonoma Compost was providing. We intend to continue the tradition of Sonoma Compost by providing a diverse line of products that you all have come to rely upon. Renewable Sonoma is adding a renewable energy component to the facility. A fraction of the green can and commercial food scraps will be processed in an anaerobic digestion plant to produce over 1 MW of green energy. The remaining organics from the anaerobic plant are then composted into a high-quality soil amendment. Renewable Sonoma has put forth a proposal to this end to the Sonoma County Waste Management Agency (SCWMA).The SCWMA evaluation team has achieved consensus to make the recommendation to the SCWMA Board to pursue an agreement with Renewable Sonoma. See the SCWMA organics agenda item for more details. Stay tuned by visiting this website for updates or visit Renewable Sonoma. Tree Mulch, Ultra Light Mulch and Path Mulch now have a discount on orders 20+ cubic yards or more. WE ARE HERE to serve you with some products that you have come to rely upon. We are working with West Marin Compost. We now have a wide lineof materials available. While we are finetuning the products, we are very pleased that we now have Vineyard Mulch, an equivalent of Sonoma Compost (Nicasio Blend), Hi-Test Compost, Mallard Plus, Path Mulch, Amended Soil and some firewood available. Give us a call for delivery or stop by to pick up. 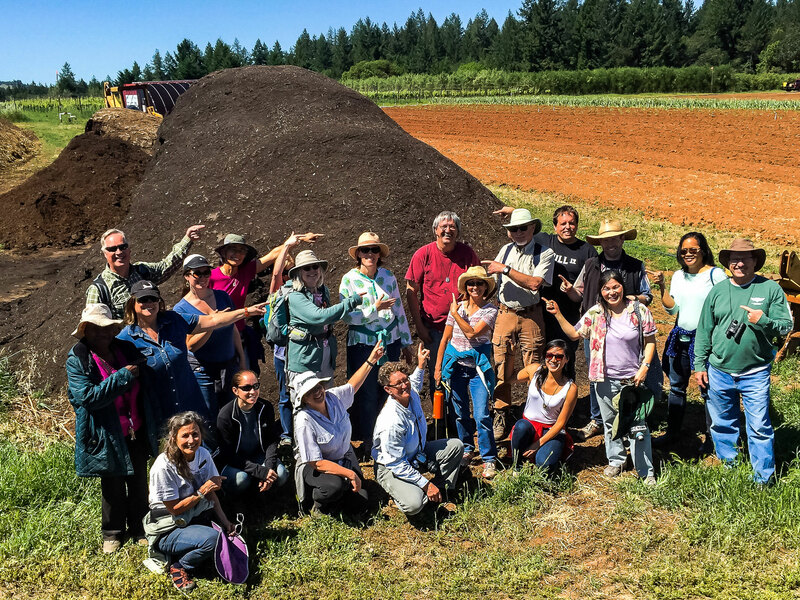 • AGRICULTURAL COMPOSTING CLASS Susag 103 at the SRJC Shone Farm (select Spring 2019 > S > Sustainable Agriculture>Susag 103). There is still space available in this class that is also attended by backyard gardeners and landscapers. All of our organics are now shipped out of County. Why not learn how to compost your own? Wednesdays April 10 - May 15 from 2:00 - 5:00 pm. The class is taught by our own soil scientist Will Bakx. After having operated the successful Sonoma County Organics Recycling Program we are now working with West Marin Compost to provide you with the best products. We produce premium quality compost and mulch from 100% recycled organics. To date we diverted over 1,800,000 tons of organics from the landfill and turned it into valuable compost and mulch. At West Marin Compost we accept clean yeard trimmings and wood scraps. The tipping fee is $20.00/cubic yard. Our soil products are used by the North Bay’s most prestigious grape growers, organic farmers, backyard gardeners and professional landscapers. We also sell firewood at very affordable prices. Many of our residents believe that a solution for our organics recycling program has been found and that a new facility will open soon. At this point it looks like a new facility is about 3 years away. The current cost to the ratepayer is about $2,000,000 per year. Meanwhile, all organics are shipped out of County. Join the Compost Coalition to stay connected (click image below). Keep this topic alive. While a small group of Sonoma Compost Co's neighbors have been successful in their lawsuit to shut down local composting in Sonoma County, we can't afford to sit back. Please, click the image above to sign on and voice your support for this program. 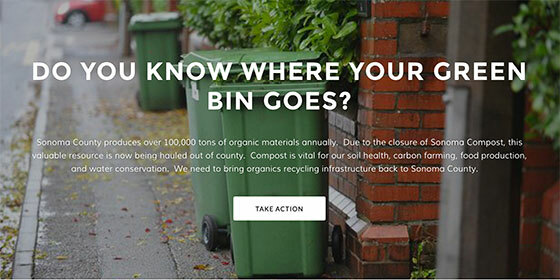 Sonoma Compost remains active in our community in outreach and communication. Check with us regularly to see what events are coming up. • Sustainable Equine Management March 4, 2017: Seminar for Anyone and everyone interested in horses or engaged in the equine industry, View. Click here to register. Sonoma Compost does presentations about on-site composting, the benefits of compost to soils, the role of compost in IPM, etc. For those who attend the presentations I leave a copy of the most recent presentation here. If you have not had a chance to attend one of the talks, it will give you a sense of what will be discussed. California can never act as if there is no drought. Everyone has to chip in to cope with our sustainable water management. If you have a lawn, lawn conversion is a green way to conserve water, soil and labor. When you remove your lawn you also remove approximately 500 years of fertile soil. The lawn that is pulled out cannot be composted, since it has too much soil in it. In the landfill it contributes to greenhouse gases. So, why not just leave it in and turn it into the foundation for a drought tolerant native landscape or vegetable garden. Simply cover the lawn with compost, cardboard or newspaper and mulch, keep moist, and nature will do the rest for you. For more information on how to do this take a look at our Lawn Conversion document. 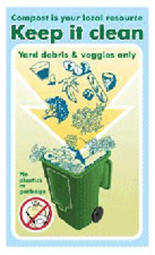 Vegetative food scraps are now being collected in the city of Sonoma. The video below, produced for Sonoma Compost by Ariana Victor, provides step by step instructions how to set-up a successful food scrap recycling program. We will miss you, but stay in touch. Find out what may be in our future. We'd love to hear from you. Go to our Facebook page. 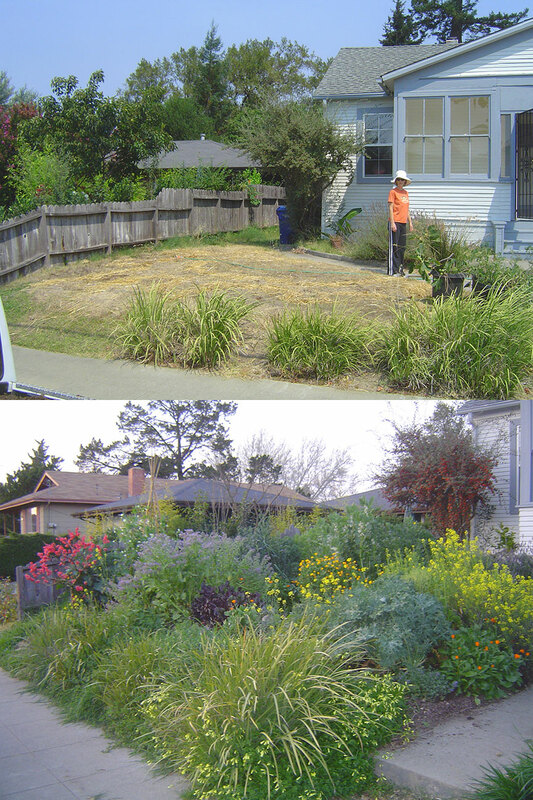 Sonoma Compost has provided compost and mulch services for over 25 years. We hope you'll enjoy this video and learn more about Sonoma Compost. Back in STOCK, price 25% reduced. Sonoma Biochar is a new innovative product that improves soils in a sustainable, lasting way. While improving your soil, carbon is taken from the atmosphere, locking it into the earth for thousands of years, thereby reducing greenhouse gases. Biochar will greatly enhance the water holding capacity of your soil, conserve nutrients through its high cation exchange capacity (CEC) and help increase microbial populations and diversity. Read more. Sonoma Compost, in collaboration with the City of Sonoma and Sonoma Garbage Collectors, launched a new program in the spring of 2011 to collect food scraps from commercial kitchens in the City. Sonoma Compost is working to establish similar programs throughout the County. For more information on this program, please read the related article in Sonoma News. Follow your yard debris and kitchen scraps from entering the facility, through the grinder, in the windrow, passing the screen to finally end up feeding the soil. Sit	back and enjoy! Celebrate Sonoma - Compost from James Parker on Vimeo. We work closely with local schools to promote organic recycling and educate school children about the importance of nature’s decomposition process. We are proud to donate compost to school garden programs and provide interesting field trips to our organic recycling facility. Biodynamic agriculture was developed to address depletion of soils following the introduction of chemical fertilizers at the turn of the century. Biodynamic principles conceive of the farm as a self-contained organism with an integrated system of crops and livestock emphasizing food quality and soil health. Sonoma Compost produces two Biodynamic Composts: Sonoma Biodynamic Compost (for vines, trees and native plants) and Biodynamic Hi-Test Compost (for hi-nitrogen loving crops such as vegetables. Next batch will be available in July). Sonoma Compost Biodynamic Composts were developed with the assistance of experts from the Josephine Porter Institute of Applied Biodynamics and the Biodynamic Association of Northern California using the Demeter® Association’s Commercial Composting Standard as a guideline. The Demeter certification program was the first ecological label for organically produced foods. Sonoma Compost Biodynamic Composts are created using the same process used to produce our other trusted composts. For more detailed information see our Biodynamic Compost Information.